What are the misspellings for officer? What are the common mistypes for officer? 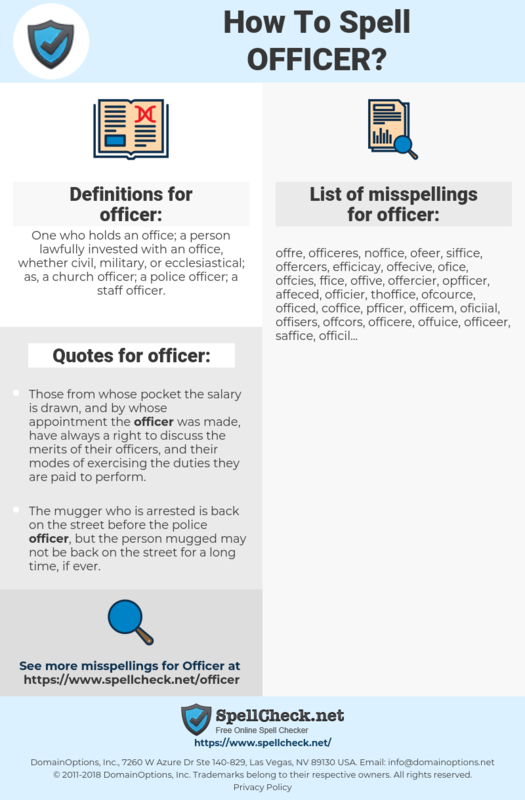 What is the definition of officer? What are the quotes for officer? What are the translations for officer? 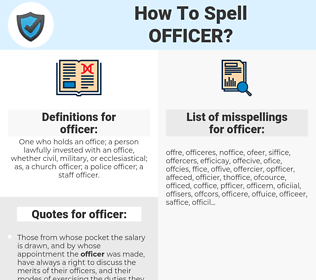 What are the common typos for officer? One who holds an office; a person lawfully invested with an office, whether civil, military, or ecclesiastical; as, a church officer; a police officer; a staff officer. This graph shows how "officer" have occurred between 1800 and 2008 in a corpus of English books. There is no reason for anyone in this country, anyone except a police officer or a military person, to buy, to own, to have, to use a handgun... and the only way to do that is to change the Constitution. The senior officer who met with reporters in Baghdad said there had been 21 car bombings in the capital in May, and 126 in the past 80 days. All last year, he said, there were only about 25 car bombings in Baghdad. responsable, dirigeant, fonctionnaire, officier, agent de police. oficial, funcionario, policía, agente, directivo, dirigente, ejecutivo.